Many experts warn children about the dangers of the Internet. We teach our children to never give their name, address, or phone number to anyone online. We watch them while online to make sure they do not visit inappropriate websites. As children become teens, we tend to back off and trust them to be careful while online. There are great risks for teens, however, and parents need to continue to watch diligently what their adolescents are doing online. The risks do change, but are just as dangerous as when our children were younger. Teens often know as much or more than their parents do about their electronic devices. Step number one for protecting your teen is to learn what the risks are and what control you have over them. Here are some of the risks I often see affecting the kids I teach. Lack of sleep. If adolescents take their tablet or smartphone to bed with them, they are likely communicating with their friends throughout the night. The culture now is to answer every tweet, posting, or message the second it goes online. Lack of sleep leads to poor performance in school, drowsiness while driving, and even to depression. It might not be easy to get him to agree, but your teen should turn the devices over to you before bed, and you should keep them with you overnight. Online bullying. Bullying used to happen during the school day or before and after school. Now, it can go on 24 hours a day, 365 days of the year. The effects of bullying are deep and devastating. It is important to monitor your teens’ online communications with other kids, and keep an ongoing dialogue about their activity there. If possible, connect with them on their social networks so that you see the comments as they are posted. Parents of all the children involved need to work together in positive ways to resolve the issues. Becoming addicted to online video games. When your child needs more and more of something and it affects his ability to function normally, then he is addicted. We tend to think of drugs and alcohol addictions, but I have known teens and adults who are addicted to video games. For kids in school, their grades suffer, they are sleepy in school, and they frequently get into trouble because they are using their devices inappropriately in class. One defense for parents is to cut off the supply of funding for the games. To be really good at most of these games, the player must spend money to buy the advantage to win. If there is no money available, the game is not as much fun. Additionally, keeping the electronics away from them at night is important. If your child does not respond to these restrictions, he may need to see a psychologist who specializes in adolescent addiction. Parenting teens is hard work. It is important to maintain diligent efforts to monitor your teen’s activities online in order to prevent serious consequences. Your child can perform poorly in school, have serious health consequences, or become addicted to online games. If you do not feel that you have adequate skills to know how to protect your child, sign up for a class or form an alliance with other parents of teens. Contact your child’s school to see if they are offering support, as well. Kids are healthier and happier when their parents work together with other parents and with the school. Heighten his listening comprehension with simple household objects. For example, use a set of keys, the kitchen faucet, a bouncing ball, or the vacuum. Ask him to close his eyes and listen for the noise you are going to make. Then, briefly shake the keys and ask him to identify the object that made the sound. Once he can easily identify single objects, try two, then three to fine-tune listening skills. Focus on the tactile sense. Make a “Guess-It” bag. 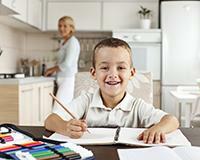 Gather a paper grocery bag or pillowcase and collect some objects that are familiar to your child. Examples can be her favorite small stuffed animal, an apple, a toy car, a sock, etc. Hide an object, one at a time, in the bag. Have her close her eyes, reach into the bag, and identify the object with her sense of touch. When she guesses correctly, encourage her to describe just how she knew. Help him think about familiar objects in different ways. Show your child a straw, a pencil, and a fork. Ask “Which item would work just as well holding the opposite end?” Ask “What else, around the house, might work just as well upside down? (A slice of bread, a baseball, a piece of cheese, an orange, etc.) Or have him think of different ways to use familiar objects. His soccer trophy could be used as a doorstop; a drinking glass could hold and display a shell collection. Wondering about, then discovering new possibilities, is a great way to encourage curiosity. This will expand a child’s ability to be a creative, divergent thinker! There are only a few weeks left of this school year. Students everywhere are looking forward to summer, and it’s hard to stay focused on school. It is important, however, to finish strong for more than just making this year a success. Success in school and life is linked to the ability to persevere even when things get tough. Educators refer to this characteristic as “grit”—and you can even take this “12-item Grit Scale” quiz to find out how much of it you have! Parents can encourage their children to do their best as they finish this school year. Here are some strategies you might try. Talk with your son about his long-term goals. Ask him, “What do you want to be when you get out of school? What will you need in order to be successful in that?” Nearly every career requires at least a high school diploma. Even college graduates have difficulty finding jobs in today’s market. Encourage your daughter to attend school every day and to be on time. Talk to her about the importance of attendance and punctuality in the workforce. Most promotions are based at least in part on it, and those who have poor attendance records are often the first to lose their jobs when a workforce must be cut. Plan an end-of-year celebration for the weekend after school lets out for summer. Allow the kids to help plan it. Explain that the celebration is for a successful school year with grades that reflect hard work and diligent effort through to the end. I am not a proponent of rewards linked to good grades only, but I am a huge proponent of rewarding perseverance and finishing to the best of one’s ability. Parents, stay strong and encourage your children to finish this school year attending regularly, completing all work the best they can, and studying for tests and exams. Then celebrate their hard work early in the summer. Remember that grit and determination are the keys to success in school and life. Parents need to be mindful of how their children are feeling when the news is full of frightening events. Stories about violent protests, natural disasters, and political turmoil are prominent on every news source. Adolescents are at an emotional point in their development, and parents need to be aware of the effects these stories have on their teens. It is very important to talk to your children about these events and others they worry about. Here are some tips for how you might approach these discussions. There are many people who protest in peaceful ways. The media often does not focus on these protests; perhaps you can spend some time with your child showing him news stories that are focusing on the peaceful, more effective protests. Also, read about Martin Luther King Jr., who won the Nobel Peace Prize in 1964 amid the racial tensions of the 1960s. When natural disasters occur, adolescents need to learn that their actions can help alleviate the suffering of others. One person might not make a huge dent, but many working together can. You can encourage your kids to lead or participate in an effort that will directly provide aid to the people they are hearing about in the news. This helps change your child’s emotional response to the news from fear into compassion for others. People can disagree about politics (or anything else) and still like one another. Unfortunately, that message is not the one portrayed by candidates running for office. With my own children, I tried to point out that there are risks and benefits for every choice we make. During political campaigns I encouraged them to read each candidate’s platform before deciding who they support. In this way, they can have an informed discussion with their friends who support a different candidate. This same approach can work when discussing any news story because the chances are great that you are not hearing the full truth. One must seek the other side of each story before deciding what to believe. Adolescents in particular are affected by events they hear on the news or read about on the Internet. Parents can help alleviate their fears by talking about them with their children, helping seek the full story in each case, and providing some guidance for positive ways to make a difference in the world. I believe that most teens are good people. With parental help, teens can become analytical thinkers who are equipped to make a real difference in the world. The ability to compare and contrast between fiction and nonfiction, or elements of a story, significantly increases your child’s reading comprehension. By helping a child compare and contrast, you are building her background knowledge and helping her subtly analyze and categorize. This connection enhances a child’s ability to remember key details in a story. Let your child choose a story of interest. Use a simple “T” chart to compare and contrast two characters in the story. On a plain piece of paper make a large capital “T” with the descending part of the letter in the middle, dividing the paper into equal left and right columns. On the top of the left column print the word same. On the right top, print the word different. Help him find at least five traits that the characters share, such as “they live in the same city.” Then find five that make them different: one was a girl, one was a boy, etc. This kind of practice helps a young reader structure events, characters, and information from what they read. This structure then becomes a good foundation to promote greater reading comprehension. Many schools are going “one-to-one,” which means every student has a laptop or tablet on which to work. While there are tremendous advantages of having access to electronic devices in school, there are some potential problems, as well. Students have access to electronic textbooks and instant information, and they have less to carry around with them in their backpacks. They also have an almost irresistible distraction sitting right in front of them on their desk. Many students cannot control the urge to browse the web, play games either alone or with friends, watch videos, or visit social networking sites when they should be working. Teachers try to monitor what their students are doing, but truthfully, it is not possible to teach a lesson and at the same time keep track of what every student is doing on his computer. The responsibility lies with each student to stay focused on their schoolwork. Here are some tricks that might help your child stay focused in class. When the computer is not being actively used for the lesson, he can partially close it or turn it so that the screen is not visible while he is focusing on the teacher. This keeps him from watching what is happening on the screen, and it also sends the message to the teacher and other students that he is listening. Teachers call this “half mast,” or “forty-five” (meaning the screen is at a 45-degree angle to the table top). The advantage for laptop users is that this keeps them from being distracted but does not shut down the computer, so it is ready to use as soon as the teacher asks for it. Tablets boot almost instantly, so he could just as easily turn it off to keep from being distracted by it. Talk to your child’s friends to let them know that during class she does not want to receive messages or play games. 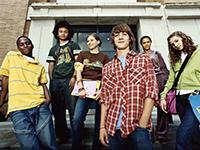 This is difficult for some teens because it is hard to stand up to peers. She could say something like, “I feel frustrated when you send me messages in class because I have a hard enough time keeping up with algebra without being distracted. I need you to wait until after class to socialize. Please don’t do that any more.” Chances are her friend will benefit from this stance as much as she will! If you allow her to practice saying this to you at home, it will be easier for her to say to her friends. Many online games require players to be logged in at all times or they lose status. These games are generally free at first, but once you get into the game it costs money to do well. This is very tempting for students to stay logged on their game during the school day. If your son is involved with one of these games, you may need to intervene. Be aware that he can also play these games on his smartphone, so if you decide to uninstall the game, you will need to check the phone, too. Splitting his brain power between schoolwork and an online game will result in lower grades in school. One-on-one programs are relatively new on the scene in schools. If your child is participating in one, help her understand her responsibility during the school day is to do her best school work. She will need to minimize distractions from the screen, her friends who want to socialize online, and playing computer games when she should be learning. The discipline she will learn will help her in other areas of her life and prepare her for college and the workplace. Subtraction is often a difficult concept for young children to grasp. Yet it is very important for math comprehension and problem-solving. Start by practicing counting backward. For a younger child start at the number 10. For a kindergarten or 1st grade student, start at the number 20. The ability to confidently and fluently count backward from these numbers allows a child to know that the number “right before” is an automatic minus one. For example, if you say 12 he should know that the number right before is 11. So, he instinctively knows that 12-1=11. Use a 12-inch ruler as a number line. Have her use her finger to actually “hop” backward on the number line as you give her subtraction to practice. You say, “What is 9-4?” She puts her finger on the number 9 then makes four hops backwards, landing on number 5. Help her remember that she doesn’t start to count until her finger moves and lands on the first hop. Have her say the complete equation, 9-4=5. Then, have her write it in a small notebook. That way you are incorporating visual, auditory, and tactile senses, which reinforce the concept for all types of learners. As she gets confident with numbers 12 and below, increase the difficulty to 15, then 20 using a tape measure. Incorporating simple math skills, like subtraction, into daily life using fun activities like these takes the mystery out of math! Paying attention in class is a challenge for many children. This is especially true late in the day when students have been sitting in class all day long and are ready for a break. It also relates to each student’s interest in the subject matter. Most students will describe themselves as a “math-science person” or perhaps “an artist,” and it can be difficult to focus in some classes more than others. For children who are diagnosed with attention issues such as ADHD, paying attention at any time is a challenge. There are strategies these children can learn, however, and they need to realize they should not use their diagnosis as an excuse for poor behavior. Here are some strategies your child can manage for himself. Sit close to the teacher. Sitting in the first row near the teacher helps him in several ways. First of all, there is less to distract him from the task at hand. Second, the teacher’s voice will be louder than other sounds in the room. Third, it will be easier to get his teacher’s attention if he does not know what he is supposed to be doing. If his teacher has a seating chart and assigns seats, your child can talk to her privately and ask for a seat near the front of the room. Learn to watch other students. Your child may realize that she doesn’t know what to do next because she was not focused on her teacher’s directions. When she feels lost, she should look at what her neighbor is doing. Is he getting his computer out? Is he doing a worksheet? Is he turning in his homework? Chances are pretty good that doing the same thing is the right thing to do. Wiggle quietly and constantly. It is a good idea to carry a stress ball to class. When he feels the need to be active, he can fiddle with it quietly under the desk where no one notices it. It is possible to wiggle your feet discreetly, as well. The trick with both of these is to make sure the fidgeting is not disruptive to others. Ask the teacher for help. Your child can talk privately with her teacher to ask him to give her a signal when she is off task. The signal can be as simple as a quick tap on the desktop or making eye contact. Teachers appreciate a student who is proactive and willing to work to be successful. Children with attention issues can learn to manage them better. Sitting in the right place, learning to watch others, wiggling without disturbing others, and partnering with the teacher can all help. If your child has a diagnosis of ADHD, find out whether she qualifies for an IEP or 504 Plan which outlines what classroom accommodations should be put in place. At the very least, meet with your child’s teacher and suggest ways he can help your child. You may want to read Are You ADHD Friendly? which suggests ways teachers can help.